The death knell for the primacy of TV advertising has been ringing for some time, but we now know when to arrange the funeral: 2016. 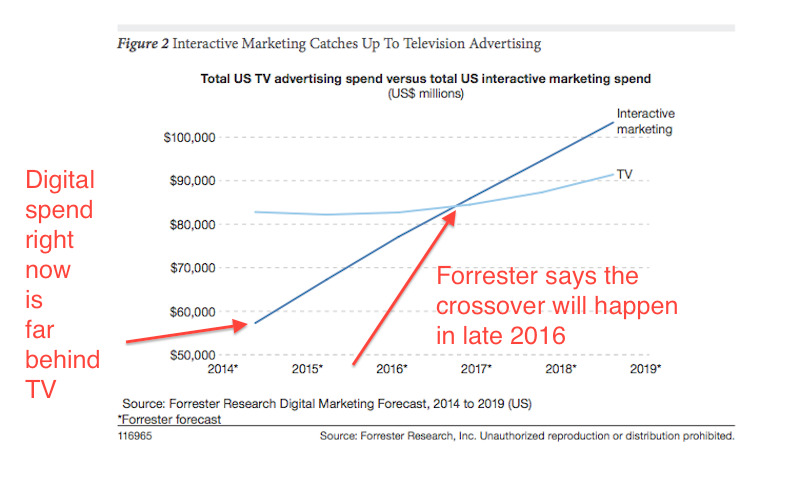 And by 2019 “interactive spend,” as Forrester calls it, will top $US100 billion, while TV advertising will be at just over $US90 billion. That crossover is coming a lot earlier than was previously thought. 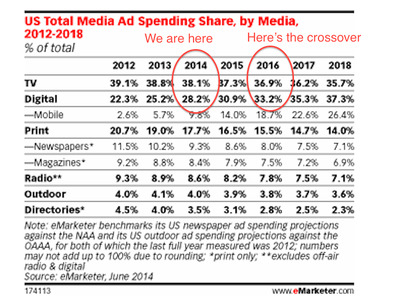 Researchers at eMarketer think the switch will happen two years later, in 2018. Magna Global, meanwhile, said in August that digital would overtake TV in 2017. 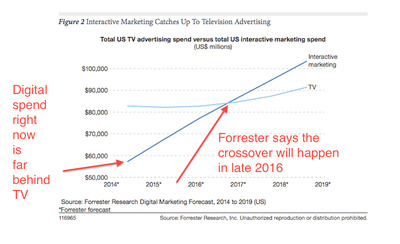 BI Intelligence has also previously predicted digital will surpass TV in 2017. The signs of the demise of the traditional TV spot have long been visible. 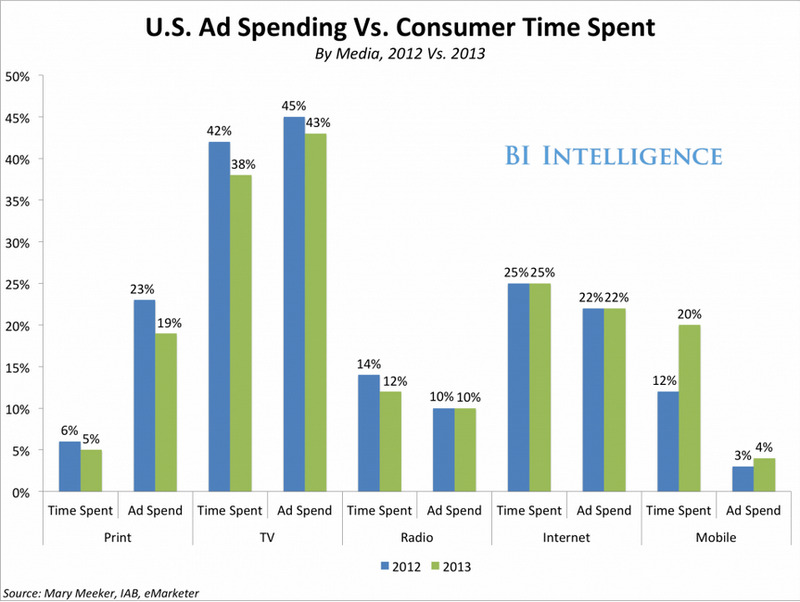 But there has recently been an acceleration in the amount of evidence pointing toward the shift to digital advertising. 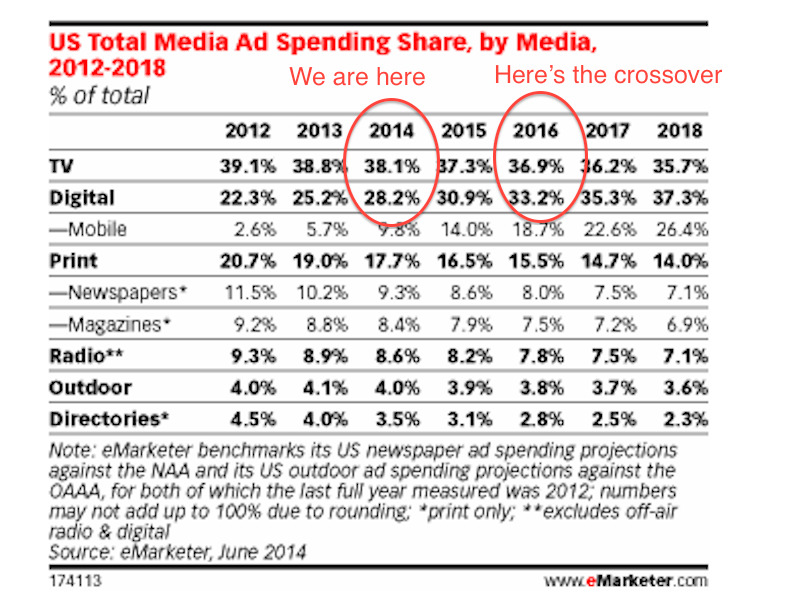 It’s worth pointing out that this evidence doesn’t point toward the death of TV networks and broadcasters (they sell a lot of digital ads too), but that marketers are increasingly pivoting their spend to focus far less around the 30-second digital spot. So it’s the end of TV’s dominance, rather than the end of TV. That’s a bracing thought: The internet is about to do to TV what it has already done to newspapers and radio. TV will become a second-rate medium, the afterthought behind digital. The Wall Street Journal reported this week of a “structural slowdown” in the TV ad market, with marketers pulling back amid economic uncertainty (TV is — aside from sponsorship or huge stunts — the most expensive form of advertising around) and the shift towards digital media. Last month Comcast reported a 4.6% decline in ad revenue across its cable networks segment. Time Warner Inc reported flat domestic Q3 ad revenue on Wednesday. On Tuesday Discovery Communications said its domestic cable network ad revenue grew at 1%, less than analysts had expected. Overall, US advertisers are committing hundreds of millions of dollars less to cable TV networks for the first time since the 2009/10 seasons, according to a report released last month from the Cabletelevision Advertising Bureau. The report found that advertisers spent 6% (or $US577 million) less on securing “upfront” deals with cable TV networks this year. The upfront represents the time of year when TV networks sell the bulk of their advertising for their most attractive Fall programming ahead of time. Also, marketers are slowly coming around to the realisation that consumers are spending more time on their desktops, mobiles and tablets than they are watching live TV. 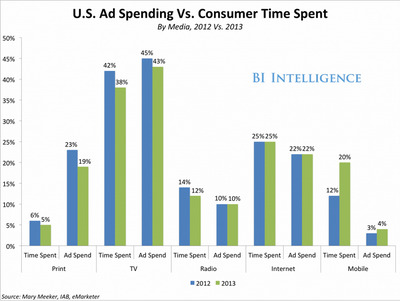 Ad spend on digital is starting to level up with time spent. Digital formats are also getting a lot more attractive than the humble 20-year-old banner ad. 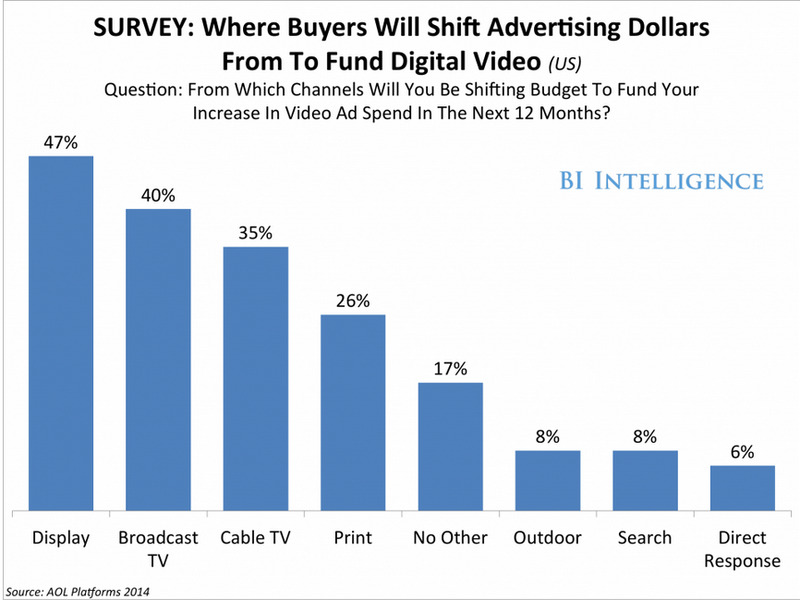 Advertisers are starting to see the branding benefit of digital video in particular. Brands can run beautiful campaigns like on TV, but they don’t have the shackles of scheduling, they can use more sophisticated targeting techniques and — currently — online video ads are still cheaper than buying primetime 30-second spots. Marketers’ budgets aren’t infinitesimal, that digital ad spend has to come at the expense of something else. For the most part it’s display advertising. And after that it’s coming from TV. On the other hand, we could just be in a period of experimentation. 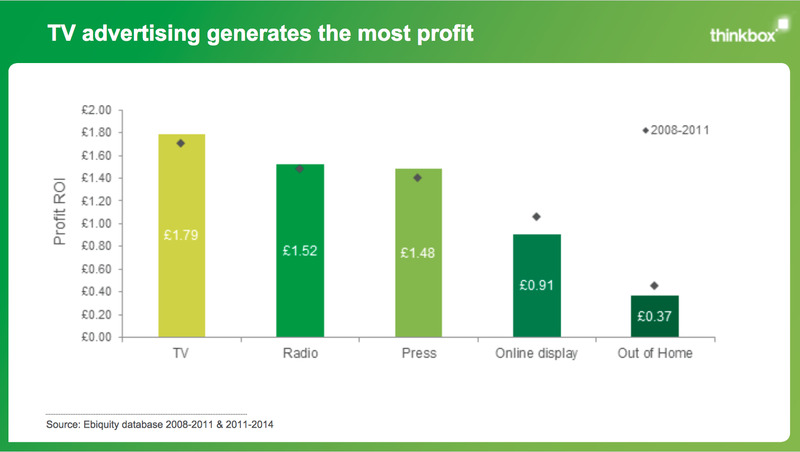 There is evidence that TV remains the most effective ad medium. A UK econometric study from Ebiquity, commisioned by UK TV marketing body Thinkbox, found that every £1 spent on TV advertising generates £1.79 in profit, far ahead of the next most effective medium, radio. Once marketers dip their toes in the digital water and find it’s not as good for raising awareness as TV, they may well perform a u-turn and do some serious grovelling with their broadcaster account managers to get their brands back in the commercial breaks. But for the next two years at least, the rise and rise of digital advertising looks to be finally coming at the expense of TV.